Hannukah commemorates the reclaiming of the Holy Temple of Jerusalem during the Maccabean Revolt. It is not some kind of Jewish Christmas. Still, with lights, prayers and gifts in December, Hannukah tends to get wrapped up in the ball of snow and tinsel as Christmas. 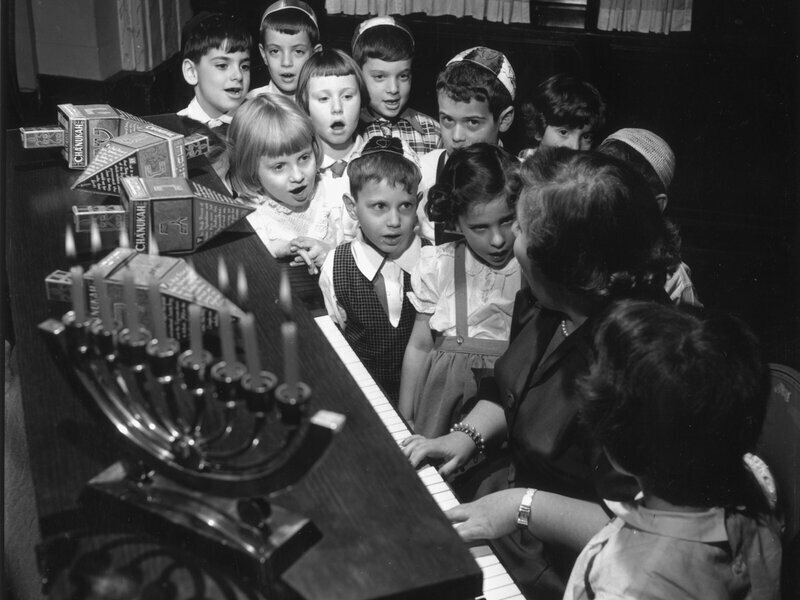 But Hannukah has its own songs — though maybe not nearly as many as Christmas. On Saturday, the eve of Hanukkah, NPR&apos;s Scott Simon took the opportunity to open up the songbook with Josh Kun, co-founder of the Idelsohn Society for Musical Preservation. They talk the history of the Hanukkah song — from its 19th-century rebranding to the rethinking of old standards today. Well, besides a good Christmas song, a good Hanukkah song has to involve, you know, lots of games — dreidel, playing dreidel, playing some more dreidel. Maybe music for cooking latkes. A good Hanukkah song, these days, really is about festivity and singing along and having a good time. It&apos;s funny, you know, my relationship to Hannukah songs really comes through — I guess what you could say the back door, but maybe it&apos;s the front door — of Christmas songs. So first, like, my favorite Jewish Hanukkah songs are actually some of the greatest Christmas songs that have been written by Jews ... like kind of, oh, all of them? "[I&apos;m Dreaming of a] White Christmas," "Rudolph the Red-Nosed Reindeer" — most of the great English-language pop Christmas songs were written by American Jews. Some of the greatest Christmas albums are, of course, Christmas albums by American Jews like Barbra [Streisand], Neil [Diamond], Barry [Manilow] and the like. But I digress. You know, I think the history of Hanukkah songs — you really actually can&apos;t separate them from the history of the mainstreaming of Christmas as a holiday. When Hanukkah starts to kind of be rebranded in the United States in the late 19th century, a big part of that rebranding was its songbook. What kind of songs could be written that could help popularize Hanukkah among Jews in the United States. One of the earliest steps in that was taking a traditional Hanukkah song that was originally written in Hebrew, "Ma&apos;oz Tzur," and it becomes "Rock of Ages" in the late 19th century. This is a cantorial recording. This is actually from the incredible archives at Yivo in New York, and that choral tradition that might not sound so Jewish, that sounds much more Christian or broadly just simply American, is no mistake, I think. There was a conscious effort — particularly, that was from the late &apos;30s — but this really builds in the late 1950s, when Hanukkah songs start to really sound like more mainstream American pop. On Adam Sandler&apos;s "Hanukkah Song"
When you mention Hannukah songs, that&apos;s probably the first song that anybody wants to talk about — which is funny because really the song, you know, uses Hanukkah as a way to get people to think about assimilation. It becomes a kind of outing of Jews who people maybe didn&apos;t know were Jewish, and a proud naming — a roll call — of American Jewish stars and celebrities. So really, again, it&apos;s a kind of example of a Hanukkah song that&apos;s not a Hanukkah song. That&apos;s Friday night at the club, Scott, that&apos;s Friday night at the club. I mean ... you know, in recent years there&apos;s been an attempt — and I think this is a great example of it — to kind of reinterpret or reclaim some of these songs. And in the spirit of, you know, the definition of Hanukkah itself, of rededicating, rethinking what Hanukkah can sound like. I think that&apos;s a great example of, in a way, repopularizing these songs and maybe encouraging younger American Jews to maybe write some of their own.